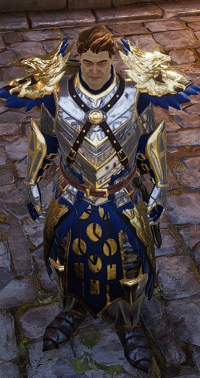 Paladin Cork is a NPC in Divinity: Original Sin 2. If you are spotted early by the guards, Cork will be pulled into combat with you and it will be difficult to save him from the Magisters. Paladin Cork died in the first battle in Fort Joy in my 2nd play through (tactician) and I received 2000xp for him dying (not by my hands). I kept him alive in my first play through (classic difficulty) but don&apos;t recall how much xp I received for him surviving. for some reason the magisters in the fort and this guy just ignore me when I walk up to them is it because I snuck in through the prison? Once you approuch him and the Captain arguing. They will attack you and hell intervien on your side. IF hes survives hell head toward the "old harbor on the otherside of hallowmarsh. I havn&apos;t check what happens but I won&apos;t be surprised if I find his corpse there. Hope it isn&apos;t like Gwain(Telaportation guy) where he is suppose to die and if everything is clear that mage still dies in the swamp for no reason.